HERESY: THIS IS A GREAT IDEA. EATING BEEF JERKY ALWAYS TIRES ME OUT - AND THE ENERGY BOOST WOULD BE JUST WHAT MY EXHAUSTED MUSCLES WOULD NEED. THIS IS A GREAT IDEA. EATING BEEF JERKY ALWAYS TIRES ME OUT - AND THE ENERGY BOOST WOULD BE JUST WHAT MY EXHAUSTED MUSCLES WOULD NEED. By the way, that tagline, "Getting a kick out of meat," would be one HELL of a good bandname. 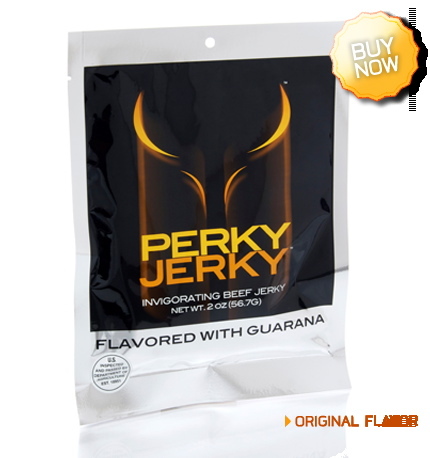 "Perky Jerky is the world's first all-natural performance enhancing meat snack. Put simply, we've combined the most tender and flavorful beef jerky, with an extra dose of energy (caffeine, from the Guarana we add) to provide a jerky experience you won't find anywhere else."